SAN FRANCISCO - Roy Halladay let it be known he would start Game 4 of the NL Championship Series on short rest. He said as much to Phillies manager Charlie Manuel and pitching coach Rich Dubee. "I told both of them that I would pitch whenever, so I think they know that," Halladay said. "It's kind of their call after that." 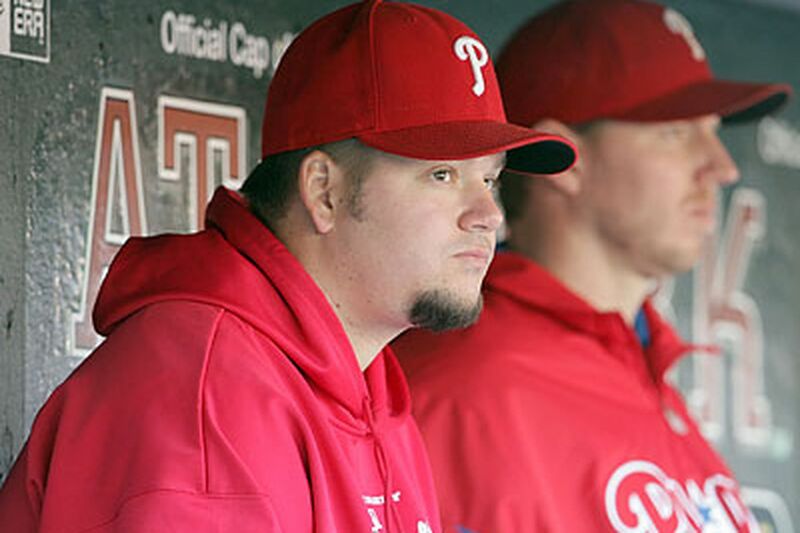 Their call is to start Joe Blanton in Game 4 on Wednesday and not Halladay. Various factors are involved, but the most important one appears to be a reluctance to use starters on short rest for the remainder of the series. If the Phillies were to skip Blanton, then Halladay, Roy Oswalt, and Cole Hamels would start in succession on short rest. Halladay and Oswalt have done it. Hamels has not. Blanton hasn't started since Sept. 29 and has yet to appear in the postseason. Under similar circumstances, he started Game 4 of the NLCS last season against Los Angeles. He allowed four runs (three earned) in six innings. The Phillies won, 5-4. Halladay, pitching in his first postseason, said he was preparing to start in Game 5, but that wasn't a concern. "I prepared normal, but it wouldn't make any difference, moving up a day, Halladay said. "You still do the same stuff." It's an important game without a member of the Big Three on the mound. Hamels said the confidence remains the same with Blanton pitching. "I know last year he's been able to get some big games in there and come through," Hamels said. "So it's another game. I definitely have - I guess all three of us have - good faith in Joe, and he's going to go out there and give it everything he possibly can." The Phillies were held to three or fewer hits for the sixth time in their postseason history. The last time it happened was Game 3 of the 2007 division series against Colorado. . . . San Francisco starters have yet to allow a run at AT&T Park during the postseason. The streak is at 222/3 innings. The Giants have pitched two shutouts at home in the same postseason for the first time since 1917, when the team was in New York. at 215-854-2928 or mgelb@phillynews.com. Follow on Twitter @magelb.